INDUSTRY.co.id - Jakarta - PT Len Industri (Persero) together with PT Hutama Karya (Persero) to build solar or PLTS power plant at the Trans Sumatera toll road of Bakauheni-Terbanggi Besar toll road, Lampung. The project was inaugurated by President Joko Widodo on Sunday. PLTS in the Trans Sumatera toll road, precisely built in the Bakauheuni Selatan toll gate area which has a 46 kWp capacity on-grid system equipped with a battery that will supply electricity to toll gates and operational offices of toll road managers. "We are synergizing our fellow BUMNs in Lampung, PLTS is aimed at saving and utilizing environmentally friendly energy," said Zaky Gamal Yasin, President Director of Len Industri at the Inauguration of Bakauheni Toll Road, Lampung, Sunday (21/01/2018). 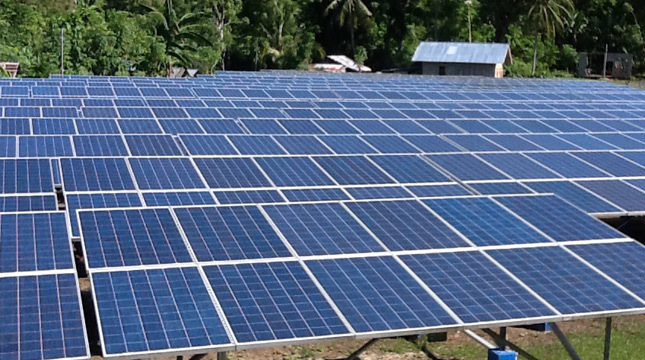 Zaky said that after investing, building and operating PLTS in Kupang in 2015 with a capacity of 5 MW which is also the largest in Indonesia, Len will continue to develop the concept of renewable energy with PLTS to reduce dependence on fossil energy by making the most of the material available in Indonesia. "Thus the achievement of 35,000 MW of electricity quickly achieved in accordance with government policy" added Zaky. PLTS has become a priority for power generation in the world and is used in many facilities including housing, airports, tourist areas, ports, including toll roads and used by electric power companies to be one of the most efficient new power sources. "Hutama Karya will utilize the surrounding land along the toll road for PLTS, Gas, Plantation and Telecommunication Networks, PLTS is renewable energy (energy of the future) which can be used as energy efficiency and reserve, we are happy to cooperate with Len to build PLTS and maximize the potential which is around the highway" said President Director of Hutama Karya, I Gusti Ngurah Putra.